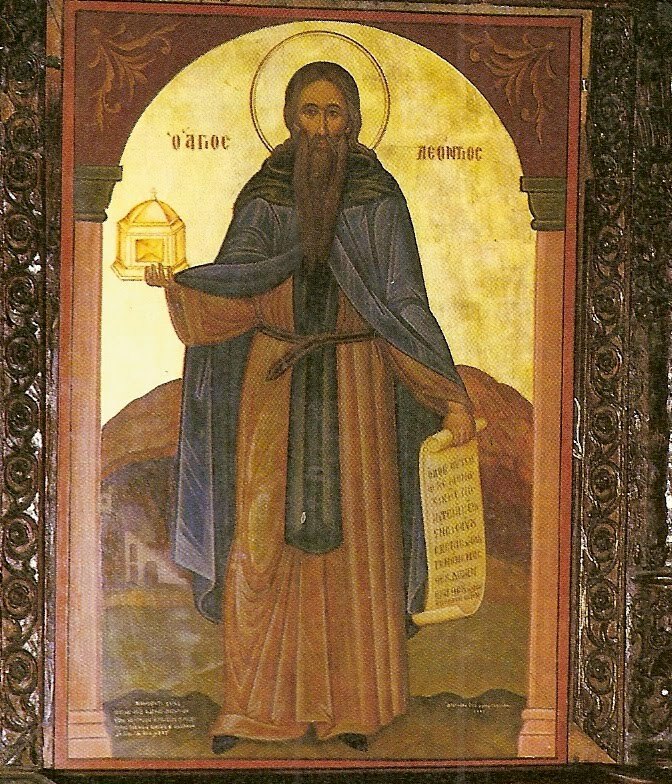 Yesterday (December 11th) was celebrated our Father among the Saints, St. Leontios the Righteous, who was born in Movemvasia and lived in asceticism in Aigialias in Achaia. 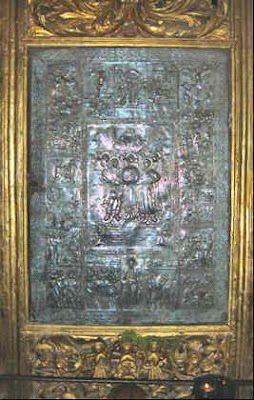 Pigi Zois had an interesting account of his life, and how the monastery he founded came to protect many relics from Christ's Holy Passion, including parts of the Precious Cross, the Crown of Thorns, the Sponge, the Purple Robe of the Lord, and also part of the ascetical garment of St. John the Forerunner. The account is translated and summarized from both http://www.pigizois.net/agiologio/axranta_pathoi.htm, http://www.synaxaristis.googlepages.com/11δεκεμβριου, and http://www.phys.uoa.gr/~nektar/orthodoxy/tributes/osios-leontios/index.htm. Slightly above the monastery of the Taxiarchs is found St. Leontios' place of asceticism. He was born around 1377 in Monemvasia of Laconia, and was a descendant of an aristocratic family, family of the Paleologos emperors of Byzantium. His name (before becoming a monk) was Leo [or Leon]. His parents were eminent and God-loving people. His mother seems to have been Theodora, the daughter of the Emperor Andronikos, and his father, Andreas, was had the office of Governor General throughout the Peloponnese. Leo was nurtured carefully and quickly managed to distinguish himself for his sharp mind and pure life. 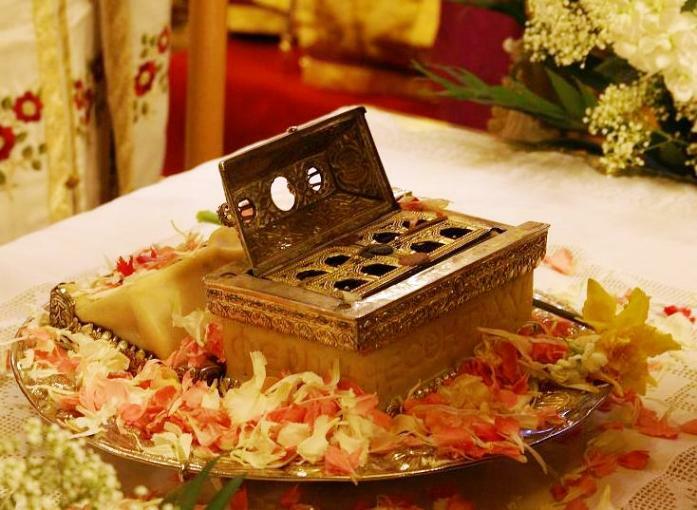 Along with the acquisition of knowledge, he worked towards spiritual cultivation, being nurtured on the Scriptures and the texts of the holy fathers. Later he was sent by his parents to Constantinople for more advanced studies. With youthful enthusiasm and remarkable dedication he studied science, and more so philosophy. Within a short time he showed such progress that even his teachers were in awe. But his father's death soon forced Leon to return from Constantinople to his birthplace of Monemvasia to help and comfort his mother. His life was prayer, and his daily care to seek God. He stayed with Fr. Mennidis for a long time, and later left for Mount Athos to seek other venerable elders. Having lived there for some time and becoming manly in virtue, he returned to the Peloponnese and sought a place of solitary asceticism. He prayed day and night for God to reveal to him were he should live. 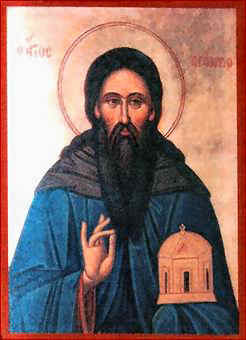 The author of his synaxarion notes: "It was revealed to him that he should head north, to the mountain known as Klokon the Elder, above Aigio." 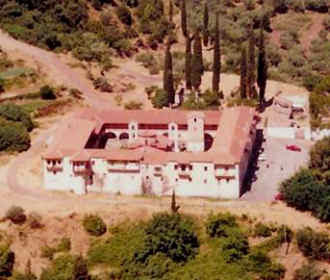 Following this vision, around 1415-1420, Leontios came to Kloko, namely to the place which is now known as the "Old-Monastery". At the base of the rock there was a natural cavity, which became inhabited by the newly-arrived monk. His presence and his teaching of the Divine Word changed the appearance of the region, and his reputation attracted many students (many of whom later entered the Holy service). 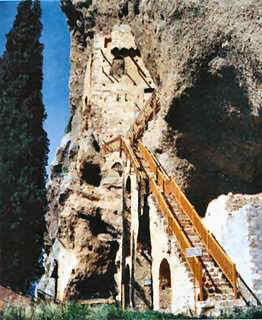 In this craggy space he built a small church dedicated to the Archangel Michael, which became known not only in the immediate area, but all over Greece, and even reached Thomas and Demetrios Palaeologus, who in his honor, offered the means to establish a majestic monastery in Leontios' place of asceticism, Kloko. The Palaeologos family gave the monastery many farms and built reservoir. They also donated Relics of the Saints, especially ones from the Awesome and Holy Passion of the Lord, including parts of the Precious Cross, the Crown of Thorns, the Sponge, the Purple Robe of the Lord, and also part of the ascetical garment of St. John the Forerunner, the first monastic. St. Leontios, who as a man, monastic, and Abbot worked wonders and enlightened all those who asked of him, fell asleep in the Lord on December 11th, 1452, at the age of 75. His Precious Body, in which he struggled in life, was placed in his cave, and forever pours forth healings to those who approach them with faith. Απολυτίκιο. Ήχος α’. Τον τάφον σου Σωτήρ. Ασκήσει λαμπρυνθείς, ως χρυσός εν χωνεία, λαμπρύνεις Μοναστών, τους χορούς επομένους, τοις θείοις σου διδάγμασι, θεοφόρε Λεόντιε, όθεν σήμερον, την φωτοφόρον σου μνήμην, εορτάζοντες, υπέρ ημών σε πρεσβεύειν, αιτούμεν προς Κύριoν. 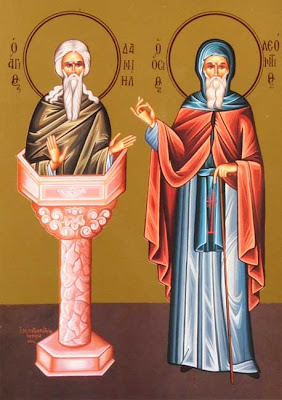 In asceticism you shined, as gold in the furnace, you illuminated Monks, the choirs who followed, with your divine teachings, O God-bearer Leontios, and today, celebrating your light-bearing memory, intercede for us, entreat the Lord. St. Leontios, intercede for us! Through the prayers of our Holy Fathers , Lord Jesus Christ our God, have mercy on us and save us! Amen!